Are you always worried that your child might be behind with his other playmates? Does riding a bike triggers fear in him? Then keep those worries away, as Chillafish bikes will help you to develop your little one's self-confidence and help them learn how to balance. Chillafish bikes are ideal for those who are looking for a balance bike for their little ones. It is lightweight, sturdy with great design. Favourably, here at Mr Toys, we have readily available items that you can purchase online. Shop online now and enjoy our effortless shopping experience! If you are looking for a bike for your little one, then Chllafish bike would be a great purchase. It had excellent features and devised intuitively to deliver premium performance. 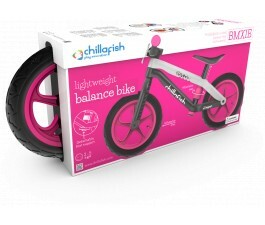 Chillafish Bunzi Gradual bike would be an excellent choice for 1-4 years old. Since it has a small, compact size and with lots of safety features. Its gradual balancing mechanism can change the bike form seamlessly from three-wheeler to two-wheeler, that allows your child to master the skill of maneuvering and coordinating with the bike, and if they are confident enough you can adjust the bike into two-wheeler bike to teach him the balancing the exact way. Perfect gift for your little one safe and promise high-quality materials. Get one now at Mr Toys Toyworld.